13 days until I board a jet plane and head to Salt Lake City, UT, to attend the 2015 FGS/RootsTech Conference. I've been busy. I'm finally updating my RootsMagic database with all the copied and downloaded files I've had for my German immigrant great-great-grandfather, Andreas Ramminger. 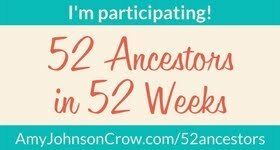 I took a German genealogy course through the Genealogical Studies program. So glad I did. Of course I wish I hadn't signed up during December/January, made things really hectic. Working through my assignments I found the Andreas with his first wife and six children in the New York Passenger List on Ancestry.com. I now have the port of departure, Rotterdam, and the date they arrived in United States, 6 July 1852. I have such a feeling of accomplishment. I've been dutifully citing all my sources. I can then file all those pieces of paper in my permanent file folders. After I've updated the database I want to generate reports, save them as PDFs and import them to my tablet computer. This way I won't have to carry all the papers on the trip. I've been checking the weather for Salt Lake and making notes on my trip check list. This time next week I'll break-out my suitcase and start throwing in the items I'll need.